I’m sure you are all familiar with Thread Theory by now. Even though they have a clear menswear focus, they decided to throw us ladies a bone and put out a women’s blouse pattern! 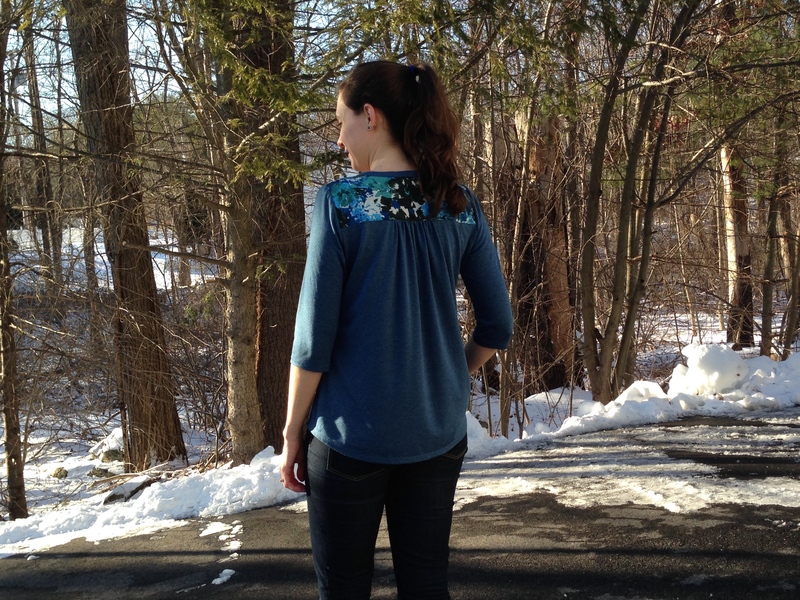 Since my name is in the tester pool, Morgan and Matt asked for some willing participants to sew up the Camas Blouse (from the finished pattern, I did not test it prior to release) and post about it. My hand shot up pretty quickly, as this is undoubtedly a pattern I would have purchased anyway. You all know I love a good button-up, and I’ve always had a weakness for the “V-necked with little gathers” variety. 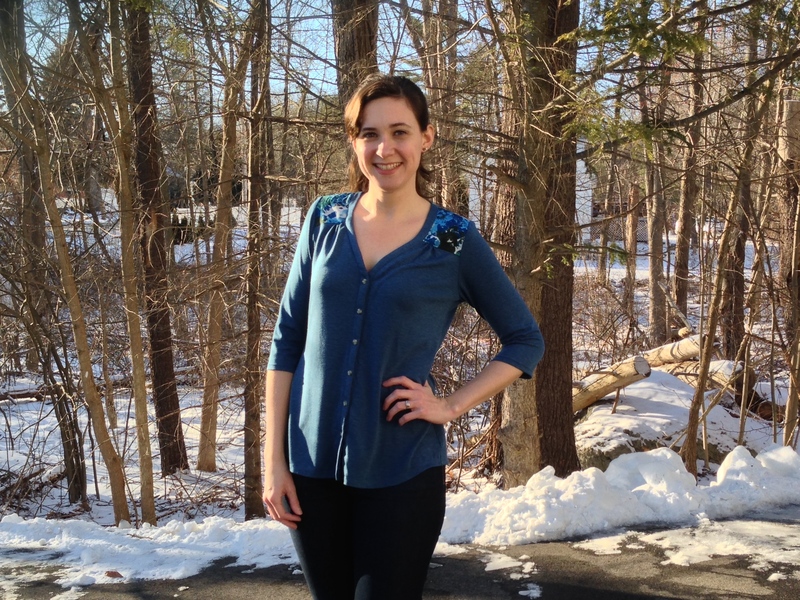 This blouse is designed for knit fabrics, and I used a rayon jersey I picked up from fabric.com on their black Friday sale (pretty sure it sold out). I had this blouse in mind when I ordered it, so I was super pleased that it was the exact weight and drape that I wanted. That doesn’t usually happen! Then I searched my scraps for a coordinating contrast fabric, and came up with leftovers from a recently made (though not yet blogged…) dress. 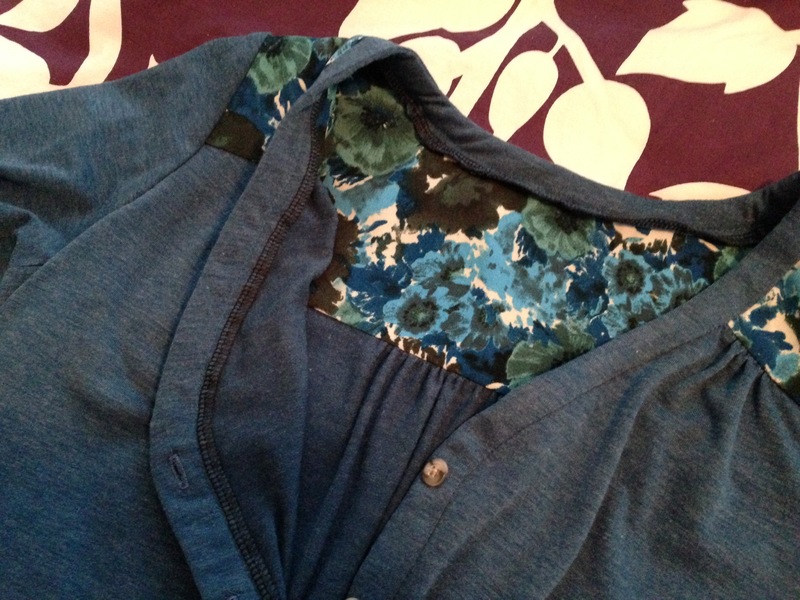 It’s actually not a perfect match, but the floral has so many shades of blue that it just kinda goes together. 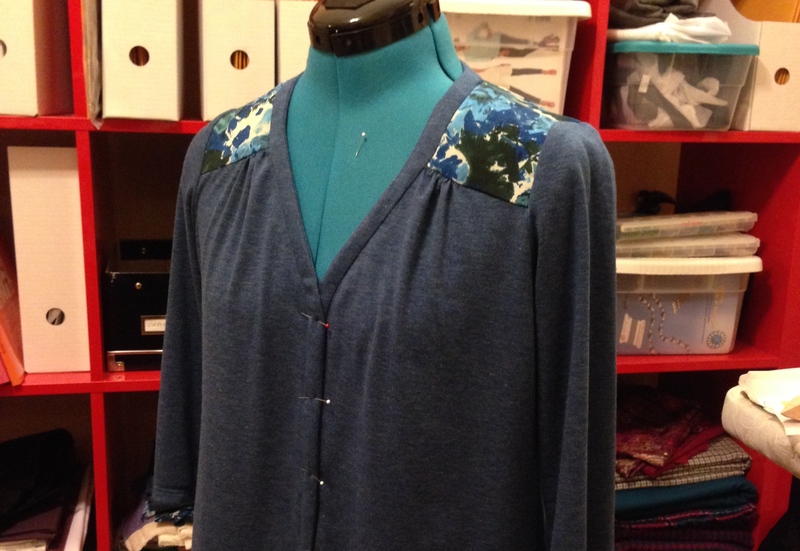 The blouse is loose fitting, so it wasn’t a problem to mix a woven fabric in for the yoke pieces. I picked a size 8 based on my bust measurement, then graded out at the waist and hip by 1/4″ (1″ all around). I was in between the 8 and 10 for my waist and hip, so I wanted to make sure it didn’t end up too clingy. The sizing was perfect, and I’m very pleased with the fit! Aside from size adjustments, I made a few tweaks to the pattern. Added 1″ in length to the hem—I’m high waisted, but also tall-ish, so I just tacked on length instead of splitting it at the “shorten/lengthen” line. In the back—I took 1″ off the bottom of the yoke, and added the inch to the top of the back piece. Visually, I prefer a narrow yoke, and since I was using a woven for the yoke, I wanted to make sure I didn’t end up with it being too tight across the back. Neckline—I raised the neckline by 1″. I have a high bust and quite often run into the problem of unintentionally plunging necklines. Altering the neckline was a little tricky to do since I had to make sure the neckband and blouse front would match around the V-neck curve. Since I was only raising it by an inch I didn’t alter the yoke piece any, just changed the angle from the yoke seam and down. If I were to raise it any further, I’d have to start the adjustment higher. Construction was pretty much a breeze, until I got to the button placket, which was very tedious. I suppose it was the wide (5/8″) SA’s that made things tricky. Trying to sew opposing curves between the button placket and blouse front with a wide SA is just a frustrating (and often inaccurate) experience. I did make sure to stay stitch and clip the most extreme curves, but next time around I’ll narrow the SA to begin with. Because the finished placket is so narrow, you have to aggressively trim down and grade the SA’s anyways. I do like how the inner placket isn’t turned under, but simply left as is, more like a facing. Then, instead of top stitching the placket, I stitched in the ditch at the placket seam line, catching the facing. When I finished the inner edge of the placket on my serger (before stitching it down), i trimmed off about 1/4″ to keep the facing nice and narrow. Lastly, this pattern suggests interfacing the yoke pieces as well as both outer and inner placket. 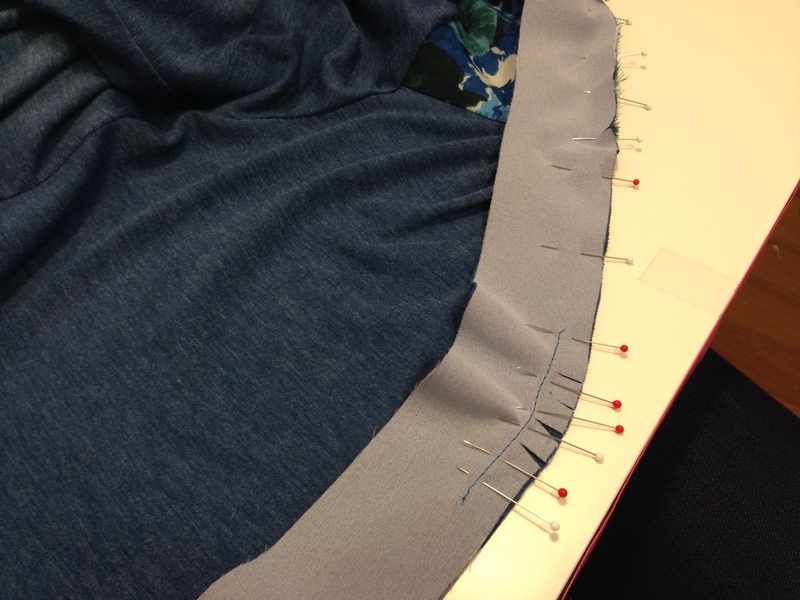 I skipped interfacing the yoke pieces since I was using a woven, and I skipped interfacing the inner placket to keep the placket from becoming too stiff. So, all I bothered to fuse was the outer button placket piece. This worked out just fine for my fabric, but you’ll want to evaluate how much interfacing to use based on your own fabric choices. I did make functioning buttonholes, even though they are totally unnecessary, as the blouse slips easily over my head. Fortunately my otherwise unremarkable sewing machine does not put up a fuss when it’s time to make buttonholes, even in knit fabrics! Overall, I am truly, honestly in love with this pattern. 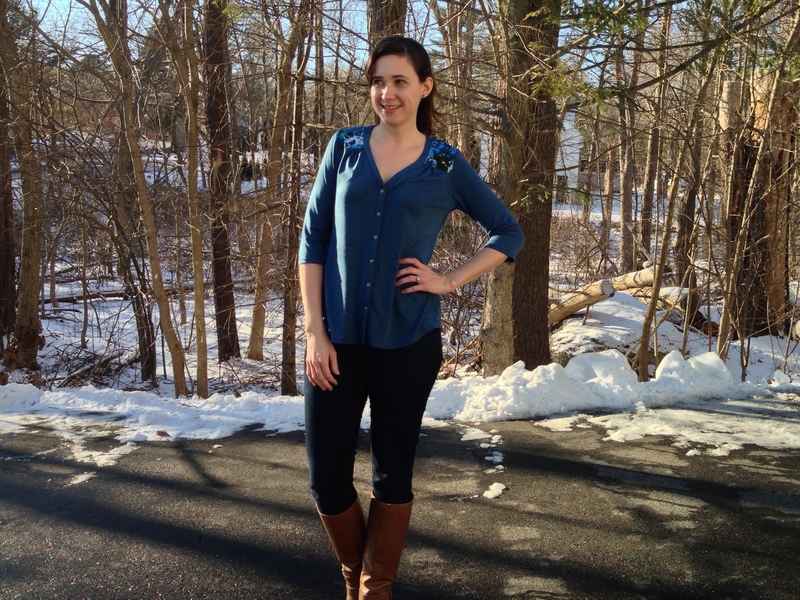 It was fun to construct a knit blouse that ends up both comfortable and a little more dressed up than your average tee. I know this will quickly become a staple in my wardrobe!